The FSM ONPA Staff attended a workshop on procurement and contract fraud which was conducted by Mr. Rob Knox and Mr. Jim Smith, representatives of U.S. Office of Inspector General Acquisition Unit under the Department of Interior. 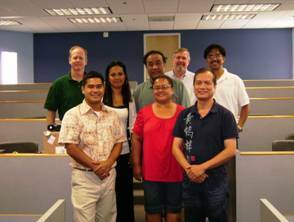 This three days workshop was held at the University of Guam (UOG) from October 27 to 29, 2008. 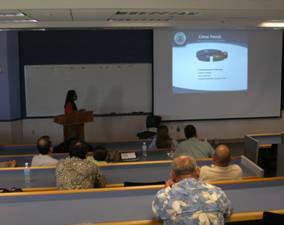 The workshop was attended by investigators and auditors from Insular Islands such as Marshall Islands, CNMI, Guam, Federated States of Micronesia (FSM), American Samoa and others. The FSM ONPA staff who attended the training were Chief Investigator Sophia Pretrick, Audit Supervisors Manny San Jose and Edwin Barnuevo, Staff Auditors Nakama Sana, Evelyn Paul and Ivan Alafanso. The workshop provided the participants with conceptual, relevant, and practical knowledge about procurement and contract fraud and its environment. The concepts learned by the participants include procurement fundamentals and contract risks, types of grants and common fraud schemes, best practices in seizing electronic evidence, identifying income thru indirect means, and building an efficient and effective fraud capability. Additionally, the practical knowledge imparted to the participants included actual discussions of settled cases from the FSM and CNMI and practical exercise to reinforce the lessons learned. One of the highlights of the workshop was the excellent presentation of FSM Fraud Briefing and Program by Sophia Pretrick, Chief Investigator of the Compliance Investigation Division under the FSM Office of the National Public Auditor. The presentation was received well by other participants as demonstrated by their interests in getting copies of the fraud program for study and implementation at their respective countries. Mr. Jim Smith and Mr. Rob Knox with FSM ONPA staff. Front row (left to right) Ivan Alafanso, Evelyn Paul, and Manny San Jose. Back row - Sophia Pretrick, Nakama Sana, and Edwin Barnuevo. Sophia Pretrick, FSM Investigator, discussing the Public Auditors new program to improve investigative activities within the FSM National and State Governments.